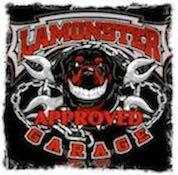 This is another great option from Lamonster Garage!! Black Dymond Floorboards and Pegs have been such popular Parts that we figured the next step was to get the matching brake pedal. Not only is it a great looking and quality part but it is also larger than the stock brake pedal making it a much easier pedal to use. Available in Accent Cut or All Black. Matches Floorboards exactly. Easy install. Works very well. This replacement pedal changes the way you will look for the brake. The pedal is easier to find and your confidence level about contact will be much higher. The OEM pedal is just too small. IMHO. The stock brake pedal leaves a bit to be desired due to its size and texture on the top. Installing this accessory made a great improvement, not only to the grip of the top surface but also the much larger size of the pedal itself. Super easy install, great look, and a high quality product. Lamonster Garage for the win! This brake pedal is the best. It is longer than the original but still leaves enough room on the floor board to rest your foot. It is metal, not rubber so you get a firm feel when you brake.